The Ultimate Road Glide® Slimline seat will sit you the SAME height and the SAME distance from the handlebars as your stock seat. The driver section of the seat is 15 1/2 inches wide and the passenger section is 12 inches wide. This seat fits with all the passenger backrest sissy bars and tour packs. All Ultimate motorcycle seats are designed with your particular comfort in mind. Our design expertise guarantees you a long distance, no numbum ride. With our exclusive comfort memory foam, you will enjoy the most comfortable ride you have ever known. Correct nose angle design will prevent you from sliding forward, so you will sit in your Ultimate Harley seat, not on it. These are 1-piece driver/passenger seats. They have been designed to have increased thigh room in the nose of the seat. Installation of the Ultimate Road Glide® Slimline Harley Davidson® Seat is the same as your stock seat, with the front under tank bracket and the stock rear trunk bolt. Easy installation. The Ultimate Road Glide® Slimline seat will sit you the SAME height and the SAME distance from the handlebars as your stock seat. The driver section of the seat is 15 1/2 inches wide and the passenger section is 12 inches wide. All Ultimate Touring Midrider motorcycle seats have built-in mounting bracket for the optional Rider Backrest, for easy installation at any time. 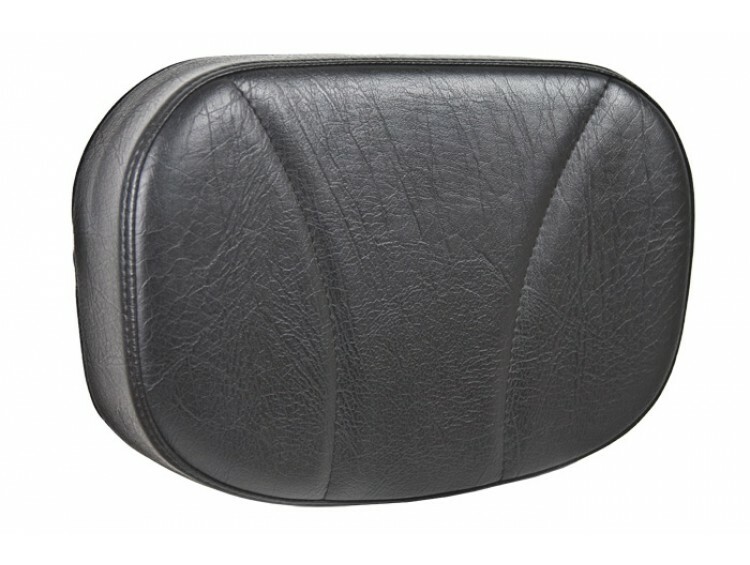 - Pad measures 10" wide by 7" high and is the same memory foam as Ultimate motorcycle seats. - Folds down forward for easy on and off mounting of your Ultimate Harley seat. - Adjusts with a thumb screw while you're riding. - Slides in and out of motorcycle seats with a built in spring loaded plunger lock. - Backrest bracket built into the Ultimate Harley seat so you can add the backrest anytime. - No need to remove the Ultimate Harley seat or use a wrench. - Bolts right on to stock sissybar with stainless steel bolts. Each Ultimate Harley seat shown on our web site is made of Ultimate premium marine vinyl. Ultimate Logo is standard on each Ultimate Harley seat in black and is included.